The home of port wine, the Douro Valley is spectacular with the hills covered with terraces of vines falling steeply down to the river banks. 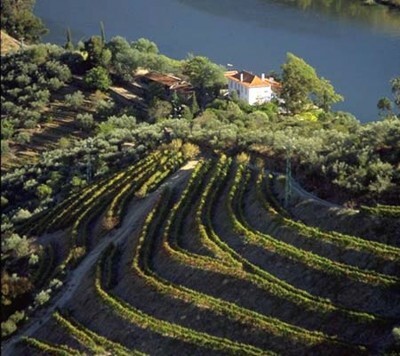 The Douro River originates in Spain and flows west in the north of Portugal until it reaches the ocean in Porto. What used to be a fast flowing river with rapids and ravines is today a tranquil river tamed by the construction of 8 dams in the last 25 years. The valley can be visited by car, there is a road along the river between Peso da Regua and Pinhao, but the best scenery is from the hills driving up the winding roads. A better way to visit the area is either by train or by cruising up the river with one of the many boat rides on offer. The picturesque Steam Train dating back to 1924 runs on Saturdays between May and October. Regular trains are available everyday with a main line and three minor routes, the most spectacular is the Tamega Line linking Livracao with Amarante. The other two are Linha da Corgo running between Regua and Vila Real and Linha Tua from Tua to Mirandela. Cruises are available from April to October and vary from a few hours to two days. It takes 11 hours by ferry to go from Porto to Regua and 9 hours on the opposite direction. Evidence of port production can be seen on the large placards of big port companies displayed on the hills, world famous names such as Taylors, Cockburns and Sandeman appear frequently. As well as port wine, regular red and white wines are produced on the valley. They are a good accompaniment to the local cuisine that is based on meet dishes rather fish, though fresh fish is readily available like everywhere in Portugal. The wine is collected in the city of Regua from where is transported down river to Vila de Gaia, the city on the other side of Porto. The scenery of the valley is spectacular with the variations of colour in accordance with the seasons, it is particularly beautiful in autumn when the vines take a reddish and golden colour, but also in February-March when the almond blossom gives an added white pinkish tone to the region.